When picking a yoga retreat the first question you should ask yourself is: what are you looking? “If a particular retreat is offering a heavy, grueling schedule with long posture sessions, but you want a physically relaxing experience, it may not be a good fit,” says Andrew Thompson, founder of Inspirational Works, which holds yoga and meditation retreats in Toronto. “If you want a significant relaxation and meditation component, make sure your retreat offers that.” It is also crucial to consider your skill level when planning a yoga retreat. While some yoga retreats may not require any prior experience, others may be strictly suited for advanced yogis. For amateurs, practicing with advanced yogis can be uncomfortable, even physically dangerous. Details such as sleeping arrangements and vegetarian menus should also be considered if you are uncomfortable “roughing it” and prefer a more lavish environment. Grace considers some of the best destinations for retreats North India, Costa Rica, Spain, Croatia, and Greece. “Word of mouth testimonials are key,” Thompson says. Try asking your favorite instructor for a recommendation; local instructors often teach at retreats or know of instructors with similar styles. You can also visit travel websites like Escape to Shape and Yoga Journal to view comprehensive listings and to read travelers’ reviews. Another way to select your retreat’s location is to start off by picking a destination you have always wanted to visit and then searching for a retreat in that area. Once you’ve done some preliminary research (almost all yoga retreats have websites), narrow down your choices. Also explore prearranged packages, which can be particularly useful when traveling to developing countries. Before booking a flight or sending a program deposit, contact the retreats’ administrators to confirm they have room during your desired time frame. Also ask any additional questions that their websites do not answer, such as how many hours you’ll be practicing yoga daily and how many people will be in each class. Take time to ask logistical questions about menus, email access, and sharing a room or a bathroom. If you have any special requests, now is the time to ask. You can also request they email or fax over an itinerary. “Make sure you have a very clear idea of what you are getting into,” says Thompson. Always pack stretchy clothes you feel comfortable in; yoga tops and pants, a sweatshirt, flip-flops, and nicer clothes for dinner at a more luxurious retreats. Stash at least one yoga outfit in your carry-on luggage is case of a luggage delay. You can also bring your yoga mat, although some programs provide them. Thompson recommends bringing “first and foremost an open mind and the desire to benefit from the experience…a journal would also come in handy to record and work through any issues that might surface.” Grace also suggests bringing earplugs “to shut out noisy roommates,” a torchlight for “visits to the bathroom during the night,” and mosquito repellant. 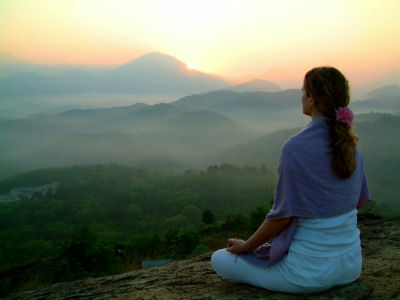 The introspective and reflective nature of yoga retreats makes them ideal for solo travelers. However, if you find it difficult to spend a week with strangers, consider organizing a group of friends. If you do choose this option, be sure to join communal activities for the full retreat experience. On the retreat you should always work within your comfort zone. “Avoid pushing yourself too hard or overdoing things,” Thompson says, as injuring yourself can easily ruin the entire trip. Thompson also advises pacing yourself mentally: “A lot of what yoga does to make you feel better takes place underneath the surface,” he says.